Levin was the one obsessed with Beetles, so for his second birthday I made him a Beetle car sweater. This is the better, revised version of that sweater, with the cars having a better shape. The hem and wrists trim of black and grey tires on white repeats at the shoulders. The wrists have black ribbing. The neck and hem ribbing is rainbow stripes. Who wouldn't want to be able to make this large a bubble, from an old fashioned bubble pipe? Do such things exist, or is this a fantasy? This was influenced by a stamp catalog I have treasured. Is it odd that the children in this sweater have no facial features? In Waldorf schools often the people in drawings have no facial features, to encourage the child's own imagination. I remember many drawings from our children that looked this way, so it never felt odd to me. Nevertheless, maybe in reknitting this I would at least add eyes. It's hard to get these details without overdoing it and having the faces ruined - at least for me. 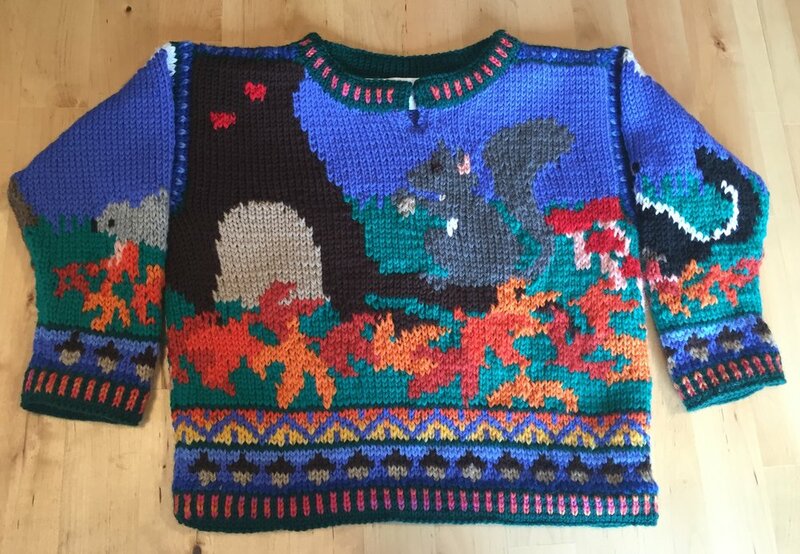 I love the details in this sweater - the rungs going up the tree trunk, the cat, the swing, the sunflowers, and the bubbles. I encircled the bubbles with chain stitching to further enhance them and complete the more circular picture. The hem is a bobble and lace pattern in dark blue. The neck and armhole trim is picot in periwinkle. The gold spirals on navy encircle the hem. The inspiration for this sweater comes from Odds Bodkin's story The Evergreens, about the evolution of evergreens and deciduous trees. My goodness, did his stories make such an impression on our children's lives! (Also Jim Weiss.) We were even lucky enough to be in New Hampshire once to see him perform live at a school. The sweet evergreens kept their needles to make warm home for birds in winter, but the deciduous trees weren't so kind, so they had to lose their leaves. In my sweater the cardinals are forgiving enough to visit the evergreens and the birches! The sleeves have an evergreen or a birch. The neck, wrists, and hem trim is evergreens against a dark blue background. Here are two versions of this sweater. 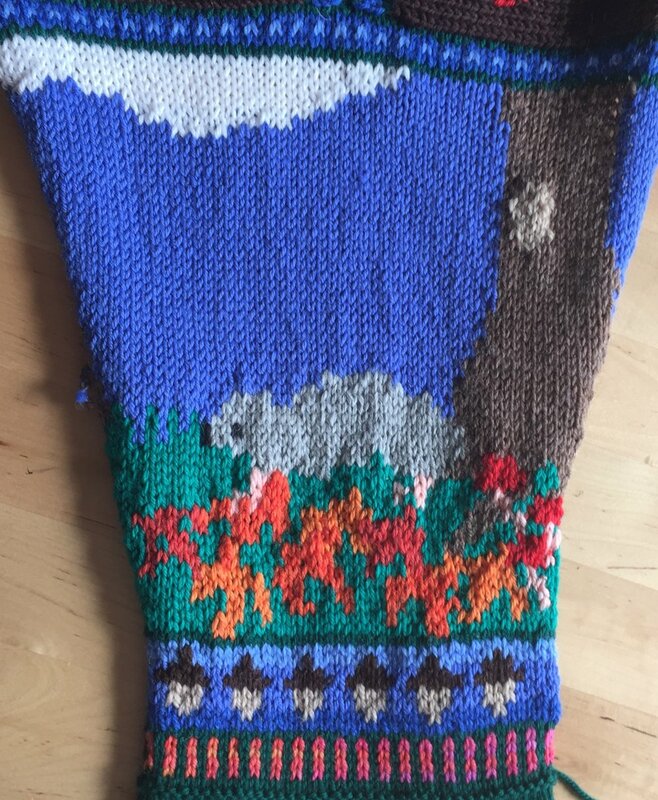 The top sweater has more details, such as the accumulated acorns in the trees on the front and back. On the second I moved the trim pattern at the shoulders down to the hem, and replaced the ribbing with the striped dark green/ variegated red trim. The second one fails because the squirrel is too hard to see. 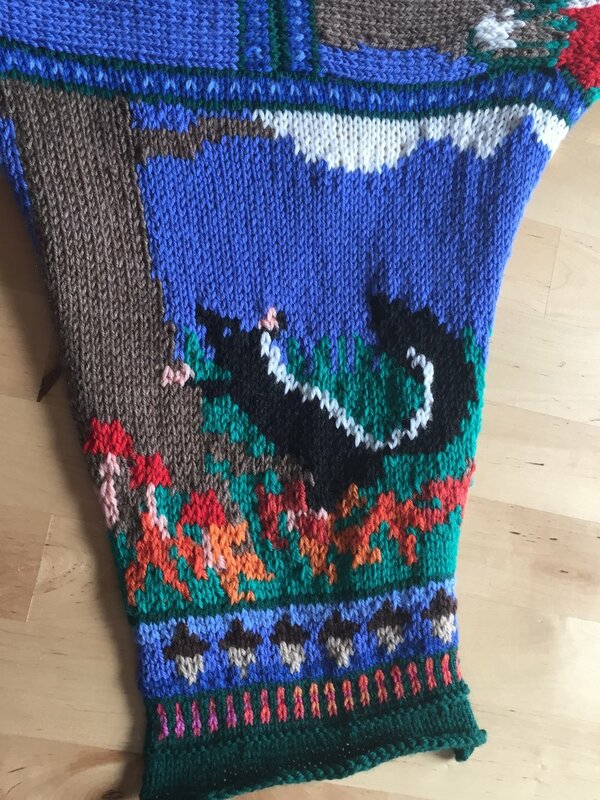 The red squirrel in the first sweater is much easier to see. 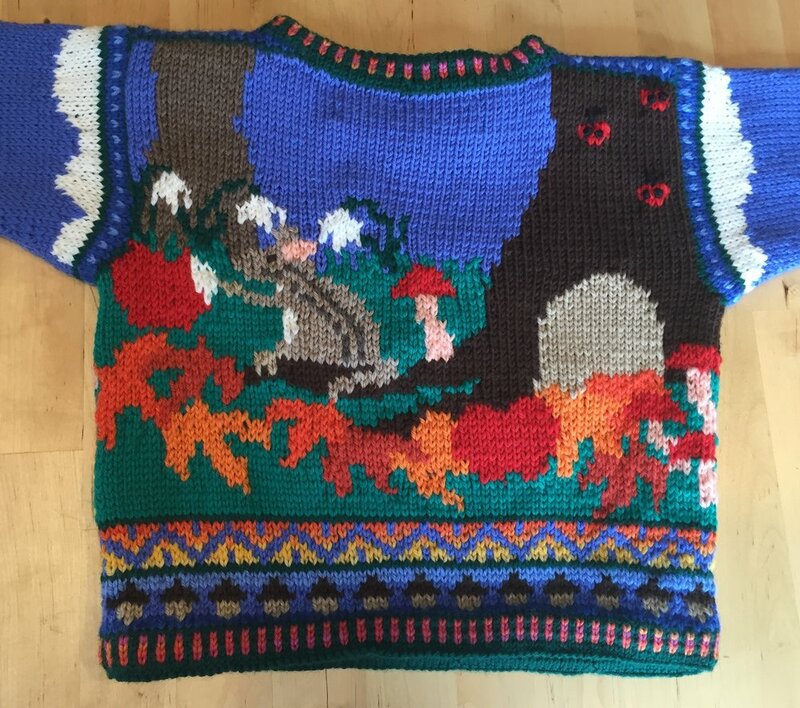 Also the pictures for the second sweater are before adding sewn embellishments, such as needles for the hedgehog and dots for the mushrooms. 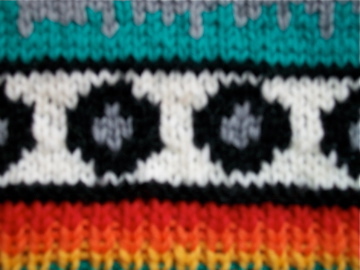 The second sweater also has to have a clasp sewn on at the neck. 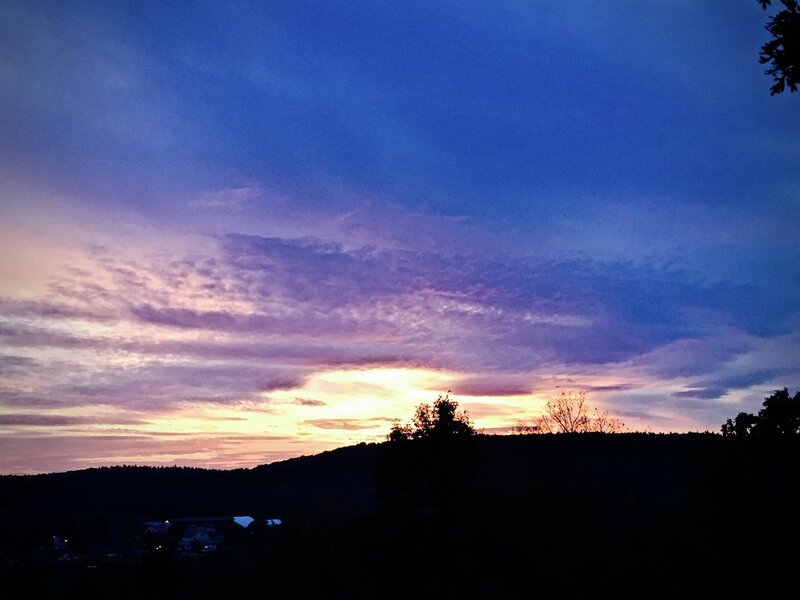 On the front a rainbow arcs across the sky, as the sun peeks behind the retreating clouds. On the back the storm is in full force, with grey clouds and lightning. Yikes for all the lightning! One sleeve has lighting and one sleeve has a bright sky sun. The neck has blue shaded double ribbing, and the wrists and hem have sun shades of double ribbing. This is a variation of Levin's Trains sweater. The country and city scene trims have been erased. The neck, wrists, and hem trims have changed also to rainbow striped ribbing.